How Are We Doing On Main Street? Jul. 19, 2013 1:00 p.m. Looking west down 50th Avenue in Wetaskiwin, there is a flurry of construction activity for 3 blocks extending from the TD Bank to the No Frills grocery store. 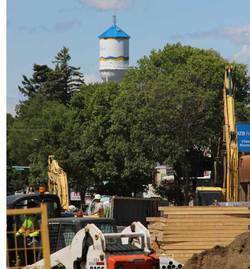 The City is in the midst of Phase II of the Wetaskiwin Main Street Revitalization project. Also looking west down 50th Avenue along the temporary plywood sidewalks it’s a different story. There is very little activity. It is common knowledge construction during Phase I in 2012 had a significant negative impact on the businesses that were located in the construction zone. The same is happening during Phase II in 2013. It is more difficult to reach entrances of businesses and it is no secret they are experiencing a drop in sales as a result of the project. Pedestrians are frustrated and businesses are feeling the outcome of that frustration. It is a very challenging time for the many businesses located along, or adjacent to, the construction of the Main Street project. Carmacks and Cobra (Construction) are doing their part to speed up the process in an attempt to reduce the negative impact on the businesses. There is no doubt having to park on the side streets adjacent to Main Street is much less convenient than residents are used to. Walking on the temporary, uneven plywood sidewalks requires more concentration than smooth concrete and having to detour around the construction site and barricades is a nuisance. Citizens are inconvenienced but it’s the businesses lining the construction zone that are taking the brunt of it and need our help. Take a walk down Main Street. Stop at some of the businesses. Even if you don’t buy anything it will be heartening to them to know you care.